MOGADISHU, Somalia (Caasimada Online)– Eritrea’s delegation led by Foreign Minister, Osman Saleh has flown back to Asmara capital, after concluding 3-day visit to Somali capital Mogadishu. The Eritrea’s Minister of Information, Yemane G. Meskel says its FM Osman Saleha, Presidential Adviser Yeman e G/ab and others senior officails had departed from Mogadishu. Meskel says the Joint High Level Committee of Eritrea and Somalia that was established during the historic visit of President Mohammed Abdulahhi Mohammed to Eritrea from 28 to 30 July held its first meeting in Mogadishu. He said Somalia and Eritrea discussed on the implementation of the joint declaration in economic, diplomatic, defense and security sectors during the meeting. 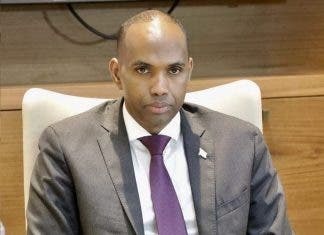 For his part, Somali President explained to the delegation the progress that Somalia has made as well as domestic and external challenges it continues to face, according to Meskel. President Farmajo reaffirmed Somalia’s commitment to the Joint Declaration signed by both countries and outlined priorities for its implementation. Last month, the presidents of Eritrea and Somalia signed an agreement to restore their countries’ relations after years of animosity.